Wharton's Olivia Mitchell discusses baby-boomers’ preparedness for retirement. Knowledge@Wharton: We know how big the baby-boomer generation is, but it’s still interesting to grasp how much investment that generation has made and how much money will be put into the economy over the next couple of decades. Olivia Mitchell: It’s absolutely true that boomers have done a good job socking away money in their tax-qualified retirement accounts. That would include individual retirement accounts (IRAs), 401(k)s, 403(b)s, the whole alphabet soup of pension lingo out there. Some baby boomers still have defined benefit plans. But the big challenge that folks are talking about now is that of this $10 trillion in tax-deferred savings accounts. Folks are now going to have to start taking out their required minimum distributions. Knowledge@Wharton: How much do they have to take out per year? Mitchell: The Internal Revenue Service has been willing to let you have your investment earnings tax-deferred. But they would be very happy to get some of their tax at the payout stage. The rules are specified related to your age. For example, beginning at age 70 1/2, you must take out about 3.7% of the total amount in your IRA and the same amount out of your 401K plans if you’re retired. By the time you’re 80, the percent goes up to about 5.5. And at age 100, you have to take out 15.9%. The logic is, the government wants its tax bite on those payouts. Knowledge@Wharton: The impact that this is going to have on the economy comes at an interesting time. There are people who fall into that group of being 70 and still working because they are still trying to build back up from the recession. Mitchell: I think there are two parts to the story. One is the financial institutions that are worried about money leaving their control. The other is workers and retirees. Many retirees may be surprised to learn that they have to start drawing down their accounts. There are ways to manage it better or worse, which we can get into. As long as you’re working, you don’t need to take the required minimum distribution from the plan that covers you in your current job. However, if you have a previous job and don’t roll that money over to your current employer, then you will have to start taking those minimum distributions. Knowledge@Wharton: It’s surprising that some people don’t know they have to do this when they reach 70 1/2. Why is that? It’s been a well-publicized marker over the last decade or two. Mitchell: It is publicized, and financial services companies are required to tell you that when you hit that 70 1/2 threshold, you must start taking out money at this certain percentage rate. But a lot of people don’t read their mail, quite frankly. They also may not have financial advisers. Right now, there are a number of good required minimum distribution (RMD) calculators online. I think that would be a good way to go for people that are finding this as new information. Knowledge@Wharton: What are the things that people need to think about when they’re managing these accounts, when they get to 70 1/2? What about the idea of taking disbursements over the course of the year or taking a lump sum per year because of the tax issues? Mitchell: If you take it in 12-month parcels, instead of one lump sum at the end of the year, that’s not going to affect your taxes. You’re still going to have to pay income tax at the end of the year. If you take it too young, however, then you also have to pay a 10% penalty. If you can avoid doing that, wait until you’re 70 1/2 to start drawing down your retirement accounts as long as you’re not working. If you have several IRAs, the law says that you can amalgamate the total and take your required minimum distribution out of just one of them, so you don’t have to dip into each individually to get to the total. However, if you have several 401(k) plans from previous employers, you have to take it out of each one separately. So, it’s a little complicated. I think this is going to be a big test for people who may potentially have cognitive aging issues and who are not financially literate. Knowledge@Wharton: Is it common for people to not roll over the 401(k) from job to job? Mitchell: I think it’s an absolutely great idea to consolidate your accounts. I’m one of those who never did it when I taught at a previous institution. I knew the money was being invested safely. I didn’t have any concerns. But it took me about a year to roll it over. So, sometimes it’s tricky, and you have to keep at it. However, having rolled it over into my current employer’s 401(k) account, I don’t have to take minimum distributions until I retire, which may well be never. Knowledge@Wharton: What are some other things people need to consider now, especially if they’re hitting 70 1/2? Mitchell: It’s certainly worth remembering that this required minimum distribution is the minimum, not the maximum. That is, you can roll over your entire account. You can cash out your entire account. Of course, you’ll pay income tax on it if you’re over the age of 70 1/2. But if it’s just a small 401(k) plan, it may well behoove you to do that and put it into the bank or a brokerage account or whatever it is that you would be doing with it anyway. This gets back to the point that a lot of the financial institutions are now thinking that it might behoove the retiree, as well as them, to let you keep your money in the 401(k) plan that you’ve been investing all the way along. Typically, those would be lower cost, more professionally managed, and they can help you by paying out the required minimum without you having to do the arithmetic ever year at tax time. Another thing you can do is purchase a payout annuity with up to $250,000 in your 401(k) account. Then that amount will start paying you when you tell it to, when you tell the annuity provider to do so. But that is withheld from the required minimum distribution amount. In other words, it reduces the amount you have to take as a required minimum distribution. That may behoove people that want to protect their assets over the longer term and don’t want to pay so much tax on it right away. Knowledge@Wharton: What’s the best reason for going the annuity route? Mitchell: There are two reasons. One is that an annuity is an excellent product to help you avoid running out of money in old age. The second reason is that portion that you’ve used to buy the annuity is exempt from the required minimum distribution. So, it can lower your tax as well. Knowledge@Wharton: I saw an article that talked about people who are starting to pull from their 401(k)s and reinvesting the money. It seems they don’t have the need for all of that money, but they want to put it in something that could still earn them value as they go forward. Mitchell: It’s been observed that many older people take the required minimum distribution percentages as financial guidance or advice, so they imagine that this might be the right way to spend down their accounts. That’s not necessarily true because you could run out under those circumstances. If you can afford to, maybe one option is to put it in a brokerage account or save it in a bank. There are also strategies that are worth mentioning in terms of how you invest the brokerage account versus what’s in your IRA or 401(k). For example, you might want to put bonds in the IRA. They’ll pay off a little bit less, therefore lowering your tax burden when you take out the RMD. And put more of your stocks, say, in your brokerage account. 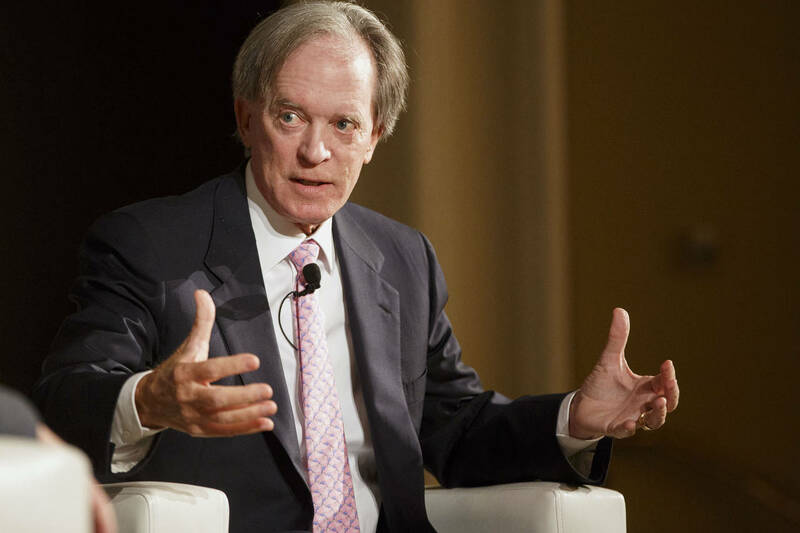 Knowledge@Wharton: The bond move is an interesting one to discuss because of what we’ve seen with bonds, especially over the last year or so. The tenure has really been jumping the last few months. Mitchell: That’s in part a reflection of the increases in inflation that are expected down the road. For retirees, my usual thought is, start thinking about inflation-protected bonds because you may well need them if inflation starts ramping up again. Knowledge@Wharton: We’ve talked with you before about the potential issues involving Social Security down the road. The word “insolvency” still is played in there. With a lot of questions about Social Security out there, does that affect how people need to think about their retirement money? Maybe not now, but maybe in 10 years when we get closer to that projected 2034 date? Mitchell: Well, it’s certainly the case that Social Security is facing insolvency. They’re not going to pay zero benefits, but there may well be a 25% cut or 30% cut in benefits down the road. Another factor to point out, vis a vis this required minimum distribution discussion, is that if you take larger distributions from your retirement accounts, then that subjects more of your Social Security benefit to income tax. One strategy might be to delay taking Social Security. Draw down more from your retirement accounts so that you’re in a lower tax bracket and pay less. When you finally hit age 70 or beyond, then take the Social Security benefit. It’s a complicated little ball of wax that we have here. And I think it really pays for folks that have some money in their 401(k)s and IRAs to start talking to an adviser. Knowledge@Wharton: With that 3.7% as the minimum amount, a lot of people have to get a feel for whether that number is right for them. Correct? Mitchell: That will depend a lot on how much you had. I had a calculation of what the typical 401(k) levels are for people close to retirement, say around 65, 66 years old. The median 401(k) balance is only about $44,000. If you took 3.7% of that, it’d be about $1,600 a year. However, if you look at the 90th percentile, those folks have about $370,000. They’re going to be pulling down $13,000, $14,000 a year. Now again, that’s probably not enough for anybody to live on, but it can definitely influence your standard of living. It suggests that some folks are going to have to draw down more than their retired minimum, and others might just tend to keep saving it and store it away for their future. Knowledge@Wharton: For people in that range of $44,000, that’s a tough spot to be in. The fact that it’s the median is a little bit scary. Mitchell: It’s absolutely the case that the typical American is relying very heavily on Social Security for retirement sustenance. And, of course, Medicare. So this may make a little bit of a difference at the margin. But what could make a much bigger difference to their retirement well-being would be delaying claiming Social Security at age 70. Your benefits could well be 75% bigger than if you claimed them at 62 years old. Knowledge@Wharton: What other things do people need to consider when they’re getting to that 70 1/2 age? Mitchell: What I would say is that it would help if people tried to do everything possible to continue working. The longer you delay retirement, it benefits you on a number of fronts. Obviously, your Social Security benefits are higher when you get there. You’re not drawing down your nest egg. And there’s a lot of research that suggests that people who can continue to work and do so are much healthier. That’s not true of everyone, of course. We know that there are disability problems among the older population. But remaining engaged and employed and involved in the workplace and in a social circle can really help along many fronts. Not just physical health, but mental health as well. Knowledge@Wharton: Getting away from the financial part of it for a second, the experience and knowledge of older workers ends up being an incredible benefit to the company. Mitchell: Absolutely. One of the things that we’re facing in the United States, as well as much of the developed world, is that the long-term decline in fertility has meant there’s simply not a lot of younger workers coming into the labor force with the training and the skills that are needed. Employers are starting to pay attention to the fact that they need to keep older workers on. I believe there will be a demand for older workers, as long as the older workers invest in their skills, learn the new technology and make an effort to stay up with things. Knowledge@Wharton: Are we going to see the retirement age here in the United States bumped up in the next decade or so? Mitchell: I suspect that we’re going to see it along a couple fronts. First, to restore Social Security solvency, we’re going to have to raise the retirement age. There’s no question about that. I think at the same time, people want to continue working. If you look at the surveys of baby boomers, many of them don’t want to sit in the rocking chair on the front porch or play golf full time. Many baby boomers are talking about un-retirement jobs. Sometimes they’re volunteer, sometimes they’re paid, sometimes they’re part-time jobs, mentoring jobs and so forth. I think that we really are at a crossroads where we are having to remake the definition of retirement. Knowledge@Wharton: Is there a target number for the new retirement age? Mitchell: Every country in the world that has tried to move the retirement age precipitously has faced some problems politically. In the U.S., we raised the retirement age back in 1983. But it was done gradually so that people had some advance warning. But if we step back and recall that when Roosevelt put in the Social Security system, age 65 was a retirement age. That was also the life expectancy. So, half of the people never even made it. If we did that, we’d probably have to have a retirement age of at least 85 or 86. Knowledge@Wharton: This is also going to be a unique challenge for the money managers, with all of this money that’s going to be coming out over the next few years and having to replace it with money from millennials, who are of a different mindset. It’s going to be an interesting dynamic for the investment community. Mitchell: It absolutely is. The good news is the millennials do seem to be saving. In fact, all of us should probably be saving a lot more, given the low-interest environment that many economists believe we’re facing for the next 20 or 30 years. I think the general perspective is that we’re going to be dealing with a younger generation that’s much more computer-friendly. This is why a lot of the money managers are putting in robo-advisers and replacing some of the call centers with interaction online. The industry is having to retool, if you will. I recently received a disturbing email. Below the ominous message was a series of charts. I couldn’t believe what I saw. These charts prove that the U.S. banking system is in serious trouble. I’ll explain what I mean in a minute. But you first have to see these charts for yourself. As you’ll see, we may be in the early stages of a major banking crisis. If you own any stocks, bonds, or real estate, I encourage you to read this Dispatch closely. It may be the most important piece of research we’ve shared all year. The first one shows the percentage change in commercial and industrial loans over the last five years. When this line is rising, it means the growth rate for commercial and industrial loans is picking up. When it’s falling, loan growth is slowing. 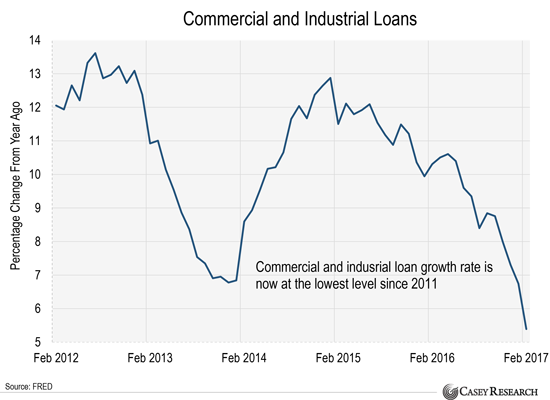 You can see that the rate of commercial and industrial loan growth has plummeted since the start of 2015. It is now less than half of where it was two years ago. Businesses borrow more money when the economy is doing well or likely to get better. They borrow less money when the economy is weak or likely to weaken. This makes a lot of sense. After all, you wouldn’t take out a huge loan if you thought the economy was going down the toilet. You would borrow less money. And that’s exactly what’s happening right now. Companies are borrowing money at a far slower rate than they were a couple years ago. This could mean business owners are worried about the future. It could even mean that the economy is careening towards a cliff. It shows the percentage change in loans and leases issued by commercial banks. 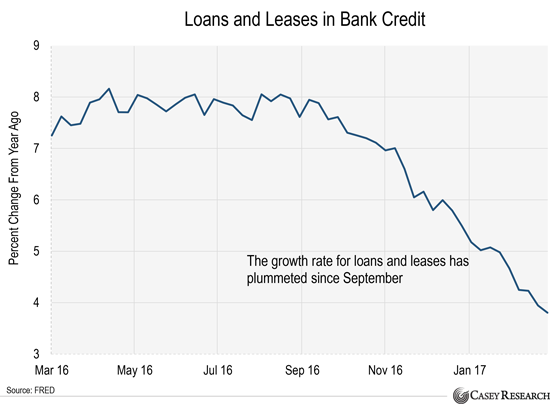 When this line is falling, it means banks are issuing new loans and leases at a slower rate than they did a year ago. You can see that this line started plunging towards the end of last year. It’s now at the lowest level since 2014. This one shows the annual rate of change for real estate loans. Like the two charts above, you want to see this line rising. It’s a bad sign when it’s falling. Unfortunately, that’s what’s going on right now. 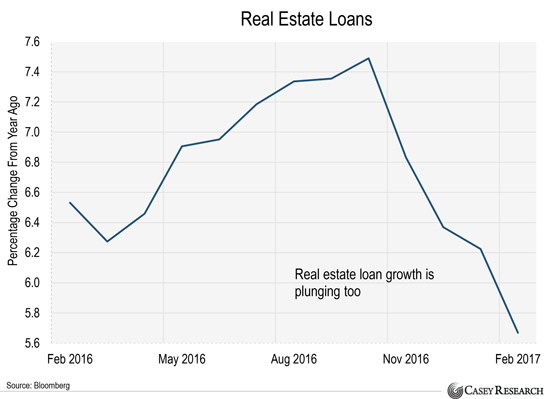 Real estate loan growth has slowed to a crawl. You can clearly see this in the chart below. 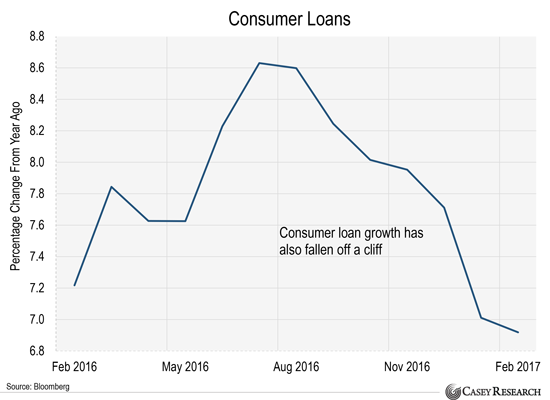 Just like commercial, industrial, and real estate loans, consumer loan growth has plummeted in recent months. The email I received contained three more charts like this. I could share them with you, but I think you get the picture. 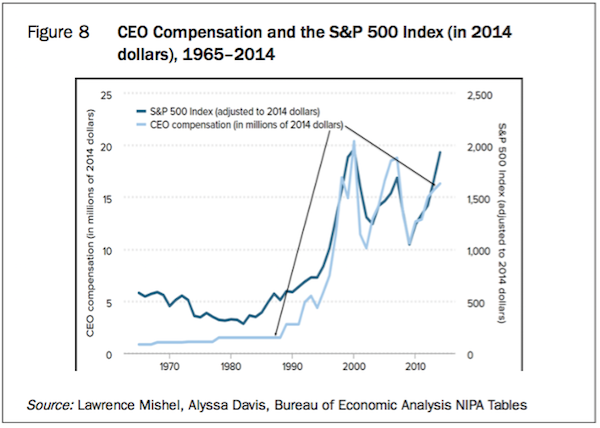 If this continues, the U.S. economy is going to have BIG problems. That's because credit is the oil that runs the economy. When credit is flowing, the economy fires on all cylinders. When it dries up, the economy can grind to a halt. And there’s little the Federal Reserve could do to stop it. After all, the Fed is already holding its key interest rate near zero. It’s trying to flood the economy with cheap credit. But this “stimulus” measure isn’t working like it has in recent years. Consumers and businesses simply aren’t borrowing as much money. This is a serious matter. But the mainstream media has barely said a word about this. Maybe they don’t know what’s going on. Or maybe they’re ignoring it. Lighten up on bank stocks. You should especially avoid regional banks if you can. These lenders make most of their money issuing loans. So, they could have serious problems if consumers and businesses continue to borrow less money. Own physical gold. Gold is the ultimate safe-haven asset. It’s held its value through every sort of financial crisis. It’s also one of the only assets that can rise when stocks, bonds, and real estate prices fall. If you haven’t already, I encourage you to buy some physical gold today…while it’s still cheap. You see, gold is already up 11% this year. And it’s now at its highest level since just before Election Day. This tells us investors are more nervous than they’ve been in months. 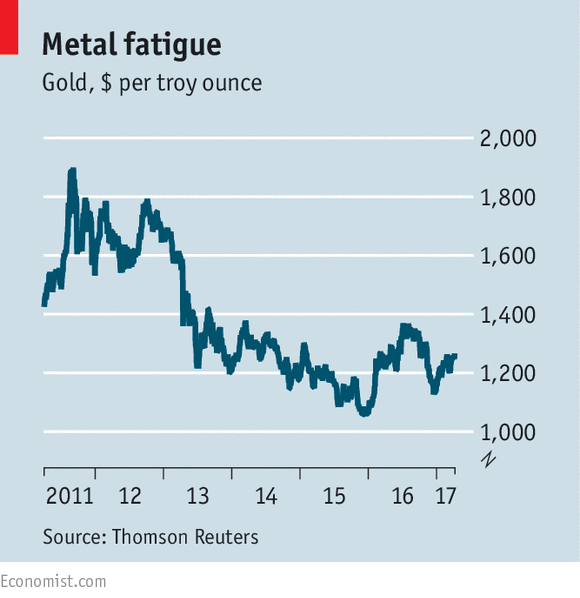 If you already have 10% to 15% of your money in gold, good for you. You’re in a much better position than most investors. Equities “are priced for too much hope,” junk bonds “for too much growth,” writes the fund manager. Here’s an investment brain teaser: Can the Trump Agenda recreate 3% annual growth in the U.S. economy? Well, now, that is the investment question of the hour/day/decade and its conclusion, unlike romance on a desert island, will determine the level of asset prices across the investment spectrum. Three percent growth leads to a levered rate of corporate revenue/profit increases and a significantly higher price/earnings ratio, all else equal. Three percent growth also sends a green light/all clear signal to high yield bonds and other risk assets that are leveraged and growth dependent. It may also, although not necessarily, lead to higher real interest rates and a future bond bear market. So what’s the answer? Well, growth is productivity dependent, and the experts are in a tizzy trying to explain why productivity in the last five years has averaged only 0.5% versus a prior pre-Lehman “old normal” of 2%-plus. Federal Reserve Chair Janet Yellen, speaking on April 10, said that no one really knows the answer, which was her way of saying that the past five years’ experience has been three standard deviations outside of the Fed’s model. But others, such as Northwestern University economist Robert Gordon, have long argued that lower productivity may now be a function of having picked all of the “low hanging fruit” such as electrification and other gains from 20th century technology. Then there is the obvious connection between recent years’ low levels of private sector investment, which perhaps begs another as to why that is so low. Optimists claim that the future benefit of smartphones and medical technology have yet to have an impact and that eventually – much like the introduction of the automobile – they will lead to a resumption of historical trends. But in a detailed report by the IMF, their economists argue that the current trend is an offspring of the financial crisis. Slowing business investment/trade and an ongoing level of low to negative interest rates have resulted in a misallocation of capital to low risk projects and a slowdown in small business creation. Longer term secular demographic factors such as an aging population also play a significant part since older consumers consume less of almost everything except health care. So Chair Yellen may just be sticking to her old models and her educated but “common sense” deficient staff that claims that no one really knows the answer. She may need to “tease” her brain that is so focused on historical but dated economic models. There may be answers and solutions that other organizations are coming to grips with. The same IMF study suggests that unless there is an unforeseen technological breakthrough, productivity growth is unlikely to return to the higher rates of the 1990s for advanced economics or the early 2000s for emerging economics. In other words, their warning speaks to a global productivity slowdown, not just a U.S. based phenomena. They warn that increasing tariffs and developing restrictions on immigration will only exacerbate the slowdown. Global growth, and of course U.S. growth, will be lower than average, they forecast. And if so, what are the investment conclusions? Well here’s where a two handed economist might fall back on the conclusion of my six original brainteasers: There is no right or wrong answer. But since I have two hands but have frequently been accused (praised) of not being an economist, I’ll post my own comment. Equity markets are priced for too much hope, high yield bond markets for too much growth, and all asset prices elevated to artificial levels that only a model driven, historically biased investor would believe could lead to returns resembling the past six years, or the decades predating Lehman. High rates of growth, and the productivity that drives it, are likely distant memories from a bygone era. If you’re “interested” in investment performance, hopefully you’ll find these conclusions somewhat “interesting.” Now pick up your cellphone and know that the only real way to have one more year of extended life is to feast on blueberries instead of Oreo cookies and to exercise daily instead of heading for your couch and widescreen. Gross manages the Janus Global Unconstrained Bond fund (JUCTX). WASHINGTON — President Trump made three startling economic policy reversals on Wednesday, stepping away from pledges he made as a candidate and even policies he supported only days ago. The shifts confounded many of Mr. Trump’s supporters and suggested that the moderate financiers he brought from Wall Street are eclipsing the White House populist wing led by Stephen K. Bannon, the political strategist who is increasingly being sidelined by the president. In a series of interviews, Mr. Trump said he no longer wanted to label China a currency manipulator — a week after telling The Financial Times that the Chinese were the “world champions” of currency manipulation. In an interview with The Wall Street Journal, the president said he no longer wanted to eliminate the Export-Import Bank. And he said that he might consider reappointing Janet Yellen as chairwoman of the Federal Reserve when her term ends next year. Yet before the election, he regularly denounced China and said that Ms. Yellen should be “ashamed” of herself because of what he said was her political bias. Mr. Trump’s latest pronouncements suggest he is moving toward a more mainstream economic approach, although on other issues that he discussed on Wednesday, like a tax overhaul and health care, his policy and strategy appeared muddled. Mr. Trump asserted in a Twitter post on Wednesday night that his agenda remained on track. Mr. Trump began the day with an interview with Fox Business Network in which he backed away from the so-called border-adjustment tax favored by Speaker Paul D. Ryan and House Republicans. He also backtracked on his claim last month that he was moving on from his plan to repeal the Affordable Care Act to focus on taxes. Now he is again putting health care first. In an interview published by The Journal midday, Mr. Trump revealed his softer approach to China — the about-face coming less than a week after meeting with China’s president, Xi Jinping — and made another reversal on health care. He said that the government would not continue to pay subsidies to health insurers under Obamacare only days after the administration said it would. Mr. Trump said the threat to withhold subsidies was a way to force Democrats to negotiate with him over the future of the Affordable Care Act. In the Journal interview, Mr. Trump said that “Democrats will start calling me and negotiating” because they want to avoid any interruption of the “cost-sharing” subsidies, which reduce out-of-pocket costs for seven million low-income people. On Monday, the Department of Health and Human Services had issued a statement saying that “the cost-sharing subsidies will be funded” while a federal appeals court weighed the legality of the payments. Mr. Trump’s remarks coincided with a letter in which doctors, hospitals, insurance companies and employers pleaded with him and with Congress to help stabilize insurance markets by authorizing a continuation of the subsidies. “Time is short and action is needed,” said the letter, sent Wednesday by eight groups including the U.S. Chamber of Commerce, the Blue Cross and Blue Shield Association, America’s Health Insurance Plans, the American Medical Association and the American Hospital Association. The president’s comments on Wednesday recalled his reaction when Republican leaders pulled a bill to repeal President Barack Obama’s health care law from the House floor last month. Mr. Trump predicted then that “Democrats will come to us” in an effort to save the law, which he said was imploding. They did not. To make the muddy waters even murkier, Mr. Trump took his plans to rewrite the tax code into uncharted territory when he threw cold water on the border adjustment tax that is the linchpin of the tax reform plan. After months of waffling on that tax, he instead called for a new “reciprocal tax” that appears to be a different kind of levy on imports. The notion left tax experts scratching their heads. “I’m genuinely confused,” said Itai Grinberg, a tax expert at Georgetown University’s law school. What is clear is that all of the uncertainty surrounding the White House’s economic plans is causing frustration among some of Mr. Trump’s supporters, including those who helped get him elected. Larry Kudlow, the economist who advised Mr. Trump when he was a candidate, panned Mr. Trump’s reciprocal tax idea as a nonsensical approach that would essentially raise taxes. He suggested that the scattershot approach to economic policy coming from the White House was probably because of poor leadership at the National Economic Council, which is led by Gary Cohn, and the diminished role of the Treasury Department, which is steered by Secretary Steven Mnuchin. Last Friday, Mr. Trump named Kevin Hassett, a conservative pro-immigration economist, to lead his Council of Economic Advisers. Ardent supporters worried it was an abandonment of the tough stance he took on the issue during the campaign. Mr. Trump shared few details about how a reciprocal tax would work. It is unclear if, in his thinking, the United States would match tariffs that countries levy on certain American products against other products that those countries produce or if he wants to effectively have a value-added tax with different rates for goods and services from each country. Either way, economists warned that economic effects could be calamitous. These quotations help us think about the macroeconomics of China’s economy. Growth at rates targeted by the government requires a rapid rise in the ratio of debt to gross domestic product. This cannot continue forever. So it will stop. Yet, since the Chinese government controls the financial system, it can continue for a long time. But the longer the ending is postponed, the greater the likelihood of a crisis, a big slowdown in growth, or both. I have argued that it is in the interests of China and the rest of the world to keep their financial systems separate. The rapid growth of indebtedness and the size of its financial system represent a threat to global stability. China needs to rebalance its economy and stabilise its financial system before opening up capital flows. Western financiers will have a different view. We should ignore this sectional interest. Yet this raises a big question: will China achieve the needed rebalancing? As was true in the west before the financial crises of 2007-08 and the eurozone crisis that followed, the maintenance of stable growth in China has coincided with an explosive growth in indebtedness. As a paper from the International Monetary Fund stresses: “Credit growth has been averaging around 20 per cent per year between 2009 and 2015, much higher than nominal GDP growth and the previous trend.” The picture is disturbingly similar to that of pre-crisis Japan, Thailand and Spain. The turning point in these credit trends was 2008. That was no accident. Between 2000 and 2007, gross savings soared from 37 per cent to nearly 50 per cent of GDP. About half of this extraordinary rise financed additional domestic investment and half financed a rise in the trade surplus. Then came the western crisis. China decided (rightly) that its huge trade surplus was no longer sustainable. It raised investment, instead. That had already risen from 34 per cent of GDP in 2000 to 41 per cent in 2007. It then jumped to 48 per cent in 2010. To achieve this outcome, the Chinese authorities promoted explosive credit growth. Before 2008, China had largely exported the credit surge attendant upon its massive rise in savings. After the crisis, it re-imported it. A recent analysis by Credit Suisse concludes that credit needs to grow about twice as fast as nominal GDP if the government is to hit its target of real growth of 6.5 per cent. The IMF adds that the credit growth coincides with declining returns on corporate assets, deteriorating corporate creditworthiness, falling efficiency of investment and rising financial complexity. We have seen this elsewhere. So will China be any different? The answer is yes and no. Yes because, like Japan, China is a high-saving, creditor country. The government controls the financial system and operates exchange controls. It may well avoid a crisis. Yet the answer is also no, because the authorities will need ever more credit expansion to achieve ever less growth. Chinese growth might then expire with a whimper, not a bang. What are the possible escapes from the trap? One option would be for the authorities just to halt credit growth. If China’s growth depended on consumption alone, one might expect it to fall to 3-4 per cent a year. But China’s investment rate is still close to 45 per cent of GDP. Such a high rate of investment could not be justified if growth were so slow. Investment would then fall, creating a recession. The only escape would be for the government to take over the investment process, rendering market-oriented economic reform a nullity. A second option would be to halt credit growth and let savings flow abroad, via a huge expansion in the current account surplus. Yet the trade discussions between Donald Trump and Xi Jinping in Florida show this would not be acceptable. Countries willing and able to run offsetting external deficits do not exist. A third option would be to halt credit growth and raise consumption sharply, to offset a decline in investment. The problem here is that household disposable income is only a little above 60 per cent of GDP, while private consumption is about 40 per cent of GDP. Such savings rates are not so high by Asian standards. More than half of national savings consist of profits and government savings. If one wanted consumption to grow faster than now, the share of household incomes in GDP or of household wealth in total wealth needs to soar. The former would squeeze profits and investment. The latter would mean transferring public assets to households. Neither looks technically and politically workable. So consumption will not keep the economy from stalling. A final (and perhaps best) option would be for the government to put much of the debt on its own balance sheet. It could restructure existing debt and be the principal borrower in future. China would become a premature Japan. While government debt would rise, the borrower would be the country’s most solvent entity. Meanwhile, the private economy would be allowed to adjust to market signals. 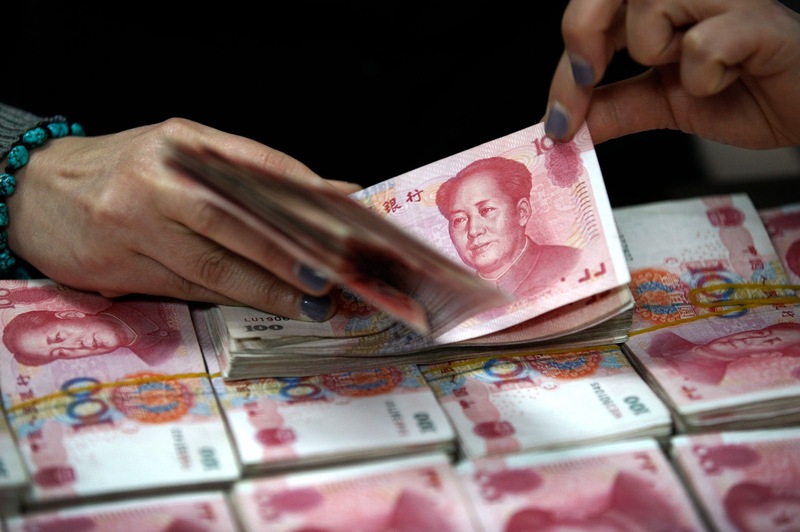 Today, China can achieve growth of over 6 per cent only with rapid rises in indebtedness. All escapes from this trap are hard. The economy is now slowly rebalancing into consumption. But this will take well over a decade. Will the growth of debt be sustained until then? I doubt it. CAMBRIDGE – It appears that a new consensus has taken hold these days among the world’s business and policy elites about how to address the anti-globalization backlash that populists such as Donald Trump have so ably exploited. Gone are the confident assertions that globalization benefits everyone: we must, the elites now concede, accept that globalization produces both winners and losers. But the correct response is not to halt or reverse globalization; it is to ensure that the losers are compensated. This argument seems to make eminent sense, both economically and politically. Economists have long known that trade liberalization causes income redistribution and absolute losses for some groups, even as it enlarges a country’s overall economic pie. Therefore, trade deals unambiguously enhance national wellbeing only to the extent that winners compensate losers. Compensation also ensures support for trade openness from broader constituencies and should be good politics. Prior to the welfare state, the tension between openness and redistribution was resolved either by large-scale emigration of workers or by re-imposing trade protection, especially in agriculture. With the rise of the welfare state, the constraint became less binding, allowing for more trade liberalization. Today the advanced countries that are the most exposed to the international economy are also those where safety nets and social insurance programs – welfare states – are the most extensive. Research in Europe has shown that losers from globalization within countries tend to favor more active social programs and labor-market interventions. If opposition to trade has not become politically salient in Europe today, it is partly because such social protections remain strong there, despite having weakened in recent years. It is not an exaggeration to say that the welfare state and the open economy have been flip sides of the same coin during much of the twentieth century. Compared to most European countries, the United States was a latecomer to globalization. Until recently, its large domestic market and relative geographical insulation provided considerable protection from imports, especially from low-wage countries. It also traditionally had a weak welfare state. Could the US now reverse course, and follow the newly emergent conventional wisdom? Back in 2007, political scientist Ken Scheve and economist Matt Slaughter called for “a New Deal for globalization” in the US, one that would link “engagement with the world economy to a substantial redistribution of income.” In the US, they argued, this would mean adopting a much more progressive federal tax system. Slaughter had served in a Republican administration, under President George W. Bush. It is an indication of how polarized the US political climate has become that it is impossible to imagine similar proposals coming out of Republican circles these days. The effort by Trump and his Congressional allies to emasculate former President Barack Obama’s signature health-insurance program reflected Republicans’ commitment to scaling back, not expanding, social protections. Today’s consensus concerning the need to compensate globalization’s losers presumes that the winners are motivated by enlightened self-interest – that they believe buy-in from the losers is essential to maintain economic openness. Trump’s presidency has revealed an alternative perspective: globalization, at least as currently construed, tilts the balance of political power toward those with the skills and assets to benefit from openness, undermining whatever organized influence the losers might have had in the first place. Inchoate discontent about globalization, Trump has shown, can easily be channeled to serve an altogether different agenda, more in line with elites’ interests. The politics of compensation is always subject to a problem that economists call “time inconsistency.” Before a new policy – say, a trade agreement – is adopted, beneficiaries have an incentive to promise compensation. Once the policy is in place, they have little interest in following through, either because reversal is costly all around or because the underlying balance of power shifts toward them. The time for compensation has come and gone. Even if compensation was a viable approach two decades ago, it no longer serves as a practical response to globalization’s adverse effects. To bring the losers along, we will need to consider changing the rules of globalization itself. But, as I have explained in the past, the distribution of wealth has become more unequal, with the 0.1% (the super-wealthy) doing extremely well, while the median household’s or asset owner’s wealth has declined by close to 40% in real terms (adjusted by the CPI) from its peak in 2007 (see Figure 2). I now wish to make some further observations about the increase in household wealth, in both nominal and real terms, of the 0.1%. Say I own a nice property in Beverly Hills, Newport Beach or Palm Beach. I bought the property 15 years ago for US$1 million. It’s now worth US$10 million. Over the same period, the CPI is up by 25%. Therefore, adjusted for inflation, my house has appreciated by 75%, correct? Not so fast. First of all, the cost-of-living increase over that period of time has been far greater than the CPI indicates (and includes taxes, home maintenance costs, school fees for my children, salaries of my housekeepers – that is, unless I’m a member of Congress who employs illegals). So, the real wealth increase, even measured by an index of consumption-related expenditures, may be far lower than that which is deflated by the official CPI. Furthermore, let us assume that I decide to sell my US$10 million house in Beverly Hills with the intention of buying another house in Palm Beach, Newport Beach, San Francisco, or an equivalent location. What will I pay for that house? I suppose it will be something like the inflated price at which I’m selling my existing home. I invite a statistician to explain to me what is a more appropriate index against which to measure the price of my house: the CPI, or an index of property values in an equivalent location? Measured against the CPI, my house has appreciated; however, measured against a property price index it may have gone up somewhat more, or somewhat less, than the index, depending on how the prices of other homes comparable to my house have moved in the same location. Now, someone might argue that, regardless, I would have done very well compared to the median US household and the 50% of Americans who have no assets at all. That argument is correct. In an asset inflationary environment, asset holders do far better than people who don’t own any assets. (The same is true in a consumer price inflationary environment such as we had in the 1970s.) But my point is that, unless, after selling my US$10 million house, I move to an area that has appreciated only very little or has even gone down in price, in reality I have no net wealth gain. I concede that I could move to Mexico City, Rio de Janeiro, Bahia, New Orleans, Bali, Pattaya, Maputo, or a similar location, and purchase a house equivalent to the Beverly Hills house that I’ve just sold, but for a fraction of the price. In some places, I might even improve my standard of living meaningfully. But in other locations, the environment may not be to my liking at all. The point I wish to make is that my wealth increase as represented by the Beverly Hills house is largely illusionary, unless I sell that expensive property and move to a far less expensive area. The same would be true of an investment in the stock market. In the 1970s, I could buy the Dow Jones Industrial Average for less than 1,000. 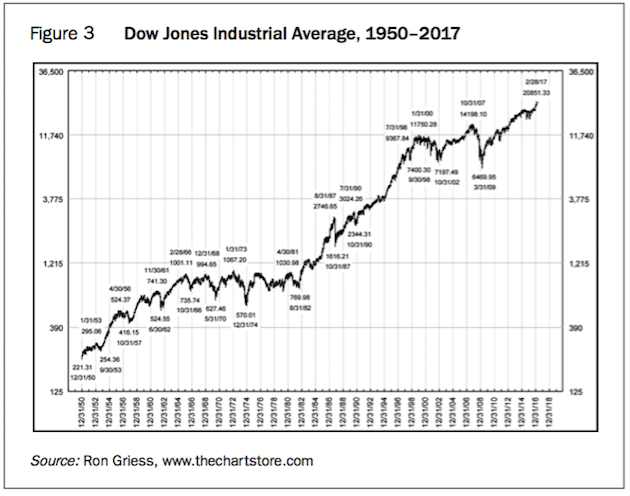 Now, I need to pay 21,000 for one Dow Jones, which is 21-times what I would have paid in the seventies (see Figure 3). 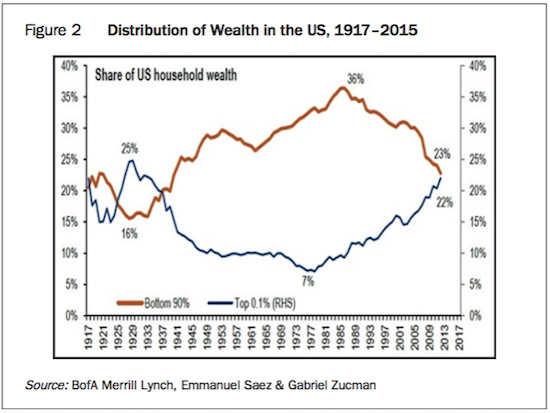 Over the same period of time, US household wealth has increased by about the same amount (see Figure 1). Naturally, the total return of the stock market (including reinvestment of dividends) over the same period was far higher. 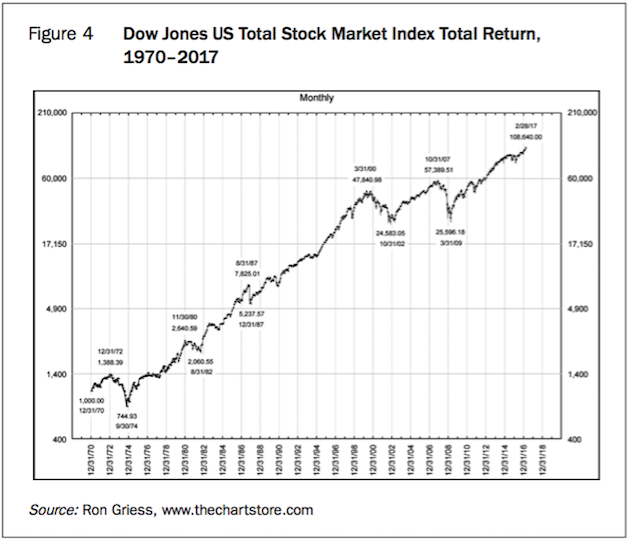 The Dow Jones US Total Stock Market Index appreciated more than 100-fold between 1970 and 2017 (see Figure 4). (The Dow Jones US Total Stock Market Index is an all-inclusive measure composed of all US equity securities with readily available prices.) The total returns of other indices such as the S&P 500 and the Dow Jones Industrial Average are of a similar magnitude, whereby value outperformed growth over the entire period. There are several reasons why household wealth increased far less than the total return of the stock market. The main component of household wealth is pension fund assets (approximately US$22 trillion). Since pension funds hold a diversified portfolio of assets consisting of stocks, bonds, cash, real estate, alternative investments, etc., they underperformed the total return of a stock portfolio. Households also have large real estate holdings in the form of owner-occupied homes. Owner-occupied homes are a cash-flow negative asset (taxes, maintenance costs, mortgage payments, etc.). The value of these (cash-flow negative) homes has appreciated since 1970; however, they have appreciated (with few exceptions) far less than have stocks whose dividends were reinvested. The same goes for households’ holdings of bonds and cash, and their own businesses. The value of households’ direct ownership of equities increased at about the same rate as household wealth, but at a far lower rate than the total return of equities because households tended to be net sellers of equities. I assume that households felt increasingly comfortable holding the bulk of their wealth in pension fund assets and, therefore, reduced their direct ownership of equities. 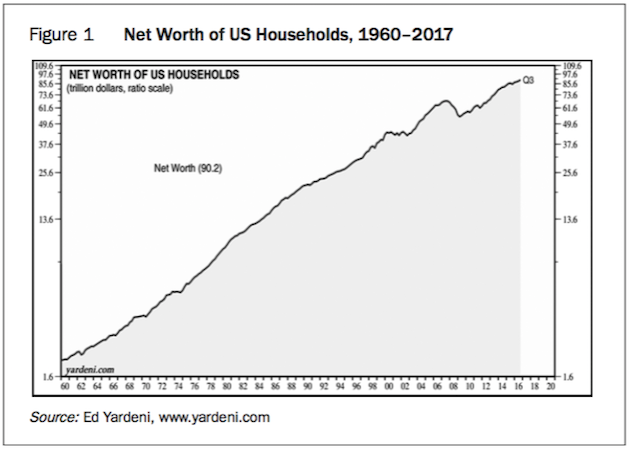 Still, there is no question that US household wealth has increased significantly since the 1970s (see Figure 1). But, can we say that the record US$89 trillion wealth of the household sector is an indication of how well the economy is performing? Furthermore, can we conclude that when a part of this household wealth is liquidated, a huge consumption and economic boom will follow? The answer to the first question is simple. Most of the increase in household wealth accrued to a tiny percentage of the population (see Figure 2). In fact, following the Trump rally, the top 0.1% of households own more than the bottom 90%. Also, as I explained above, the increase in value of my Beverly Hills house is of limited utility if I wish to continue living in an equivalent house in an equivalent area somewhere else. We then need to consider the increase in the US population, which in 1970 was 205 million and is now 318 million. Therefore, a better indication of American wealth than total household wealth would be per-capita wealth. Lastly, as I explained above, the largest component of US household wealth is pension fund reserves, currently valued at US$22 trillion. But there are some question marks over these assets and whether they are really worth this amount. Last October, my friend Fred Sheehan (frederick.sheehan@verizon. 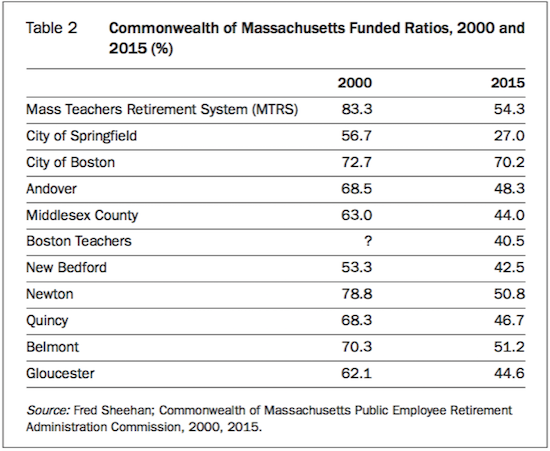 net) explained just how underfunded pension funds were, citing (among other examples) the Commonwealth of Massachusetts Funded Ratios (see Table 2). ...like 4,000 other retired Teamster truckers, [he] got a letter from Local 707 in February of last year. It said monthly pensions had to be slashed by more than a third. It was an emergency move to try to keep the dying fund solvent. That dropped Narvaez from nearly $3,500 to about $2,000. The stopgap measure didn’t work – and after years of dangling over the precipice, Local 707’s pension fund fell off the financial cliff this month. With no money left, it turned to Pension Benefit Guaranty Corp., a government insurance company that covers pensions. Pension Benefit Guaranty Corp. picked up Local 707’s retiree payouts – but the maximum benefit it gives a year is roughly $12,000, for workers who racked up at least 30 years. For those with less time on the job, the payouts are smaller. Narvaez now gets $1,170 a month – before taxes. Ex-trucker Edward Hernandez, 67, went from $2,422 a month to $1,465 last year. As of this month, his gross check is $902. After federal taxes, it’s $721 – but he still has to pay state and city taxes. “We have guys on Long Island who are losing their houses, the taxes are so high out there,” Hernandez said. Milton Acosta, 75, was a dockworker in Local 707. He retired at age 62, figuring his union pension of $2,300, coupled with his Social Security, would keep him and his wife afloat. Now his pension is $760 a month after taxes, he said. As heartbreaking as their stories are, they are not new to Thomas Nyhan, executive director and general counsel of the Central States Pension Fund. The same crisis now hitting Local 707 has been stewing among numerous Teamster locals around the country for the past decade, he said, and that includes in upstate New York. The trucking industryâ¨– almost uniformly organized by Teamsters – has suffered enormous financial losses in its pension and welfare funds due to a crippling combination of deregulation and stock market crashes, Nyhan said. “This is a quiet crisis, but it’s very real. There are currently 200 other plans on track for insolvency – that’s going to affect anywhere from 1.5 to 2 million people,” said Nyhan. “The prognosis is bleak minus some new legislative help.” And it’s not just private-sector industries that are suffering, he added. I urge my readers to peruse once again Fred Sheehan’s report, entitled “Public Pension Recipients: Start Saving. You Are on Your Own”, in the October 2016 GBD report. I explained at the time that the shocking funding level and its deterioration (see Table 2), about which Sheehan writes, is also evident in the corporate sector and in Europe. So, whereas prior to the 2008/2009 crisis S&P 1500 companies were fully funded, today funding has dropped below 80% (see Figure 7 of the October 2016 GBD report). I also noted that I found the deteriorating funding levels of pension funds remarkable because, post-March 2009 (S&P 500 at 666), stocks around the world rebounded strongly and many markets (including the US stock market) made new highs. Furthermore, government bonds were rallying strongly after 2006 as interest rates continued to decline. My point was that if, despite truly mouth-watering returns of financial assets over the last ten years, unfunded liabilities have increased, what will happen once these returns diminish or disappear completely? After all, it’s almost certain that the returns of pension funds (as well as of other financial institutions) will diminish given the current level of interest rates and the lofty US stock market valuations (see Figures 12 and 13 in the March 2017 GBD report). The next time an economist tells you that the US economy is rock solid because household wealth keeps going up and is now almost US$93 trillion (following the Trump rally), keep in mind that this wealth is unevenly distributed (see Figure 2) and that the US$22 trillion in the form of pension funds is completely inadequate to meet those funds’ obligations to pensioners. Either contributions will have to increase massively, or benefits will have to be cut, as we have seen in the case of the Teamster Local 707’s pension fund. I should also like my readers to reflect on the hardships that have to be endured by retirees if their benefits are cut by more than 50%, as we have seen in the examples quoted above by the Daily News. Furthermore, if, as Thomas Nyhan states, there is a quiet but very real crisis “that’s going to affect anywhere from 1.5 to 2 million people” (probably far more than that number nationwide), consider what the impact on consumption and the US economy will be. There is another point I need to explain. Let us assume that I belong to the 0.1% and that I have assets of US$100 million. Because of the Trump rally, I make a profit of US$5 million within a month. Will it change my consumption? Maybe at the margin (the trickle-down effect), but very little overall, compared to a thousand lower middle-class people suddenly making an additional US$1,000 each. In that case, it’s likely that the 1,000 people who enjoy a sudden “monetary” windfall of US$1,000 will spend most of it. Therefore, if wealth is concentrated in the hands of very few people, as it is now, the economic impact of household wealth rising is minimal. In other words, the level of household wealth is a very poor indicator of how the economy is really performing. This is especially true in a money-printing environment. In this context, I need to clarify another matter. Most economistsâ¨have argued that inflation is low and growth is anaemic because the velocity of money has been declining sinceâ¨the late 1990s (see Figure 5). These economists will argue that when the velocity of money picks up, inflation and growth will accelerate. But how can velocity accelerate? Let us go back to Figure 2. The top 0.1% of asset holders (the super-rich) will unlikely spend their wealth if they liquidate some assets. Let’s say that Warren Buffett makes another US$1 billion because of the Trump rally. Will he spend that money? It’s unlikely. There are, however, three ways in which the velocity of money could be increased. A complete collapse of asset markets would bring about deflation and improve the affordability of goods, services and assets for the median household – certainly relative to the 0.1%. 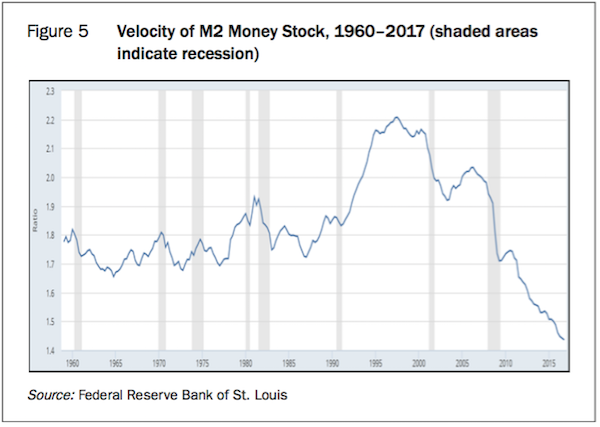 In this scenario, the velocity of money will increase, but I very much doubt that the increase in velocity would bring about stronger growth and higher inflation. A massive dose of helicopter money dropped on the 50% of Americans who are struggling and have no assets would probably be the most potent tool for boosting the velocity of money, inflation and economic growth – that is, temporarily. I say “probably” and “temporarily” because it is far from certain that this intervention would improve “real” economic activity and “real” growth. Also, “Helicopter Money One” would have to be followed by “Helicopter Money Two”, and so on, which would have numerous very negative consequences (a collapse in the dollar, very high consumer price inflation rates, further increase in wealth inequality, etc.). The third option for boosting the velocity of money would be to expropriate a significant share of the wealth of the top 0.1% of wealth owners and distribute it to the 50% who are the lowest-income recipients. Again, this would boost consum ption only temporarily and it would be a complete disaster for the overall economy. Disturbingly, this is what will be the ultimate outcome unless an authoritarian dictator seizes power, in which case the outcome could be even worse. Let me explain. Should the economy weaken and enter another recession (which is inevitable, sooner or later), QE4 will be a given. 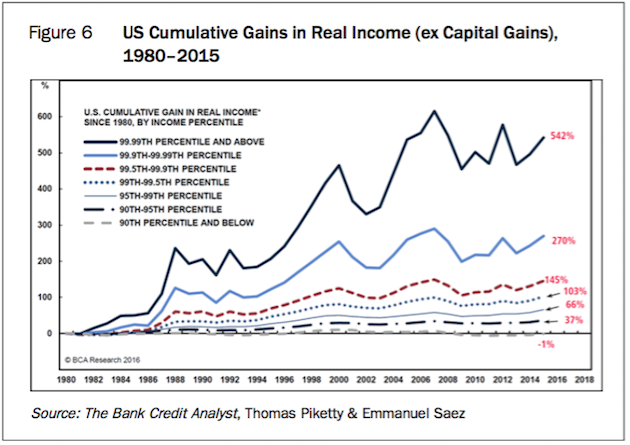 The result of QE4 would be more of the same: rising wealth inequality as asset prices continue to increase (this time, very selectively) whereby the median household is left further behind. Therefore, the next step by the interventionists will be – possibly simultaneously with QE4 – helicopter money. Helicopter money whose objective would be to kick-start the economy would be almost instantly captured by the powerful corporate sector and the asset owners, because the increased consumption would increase consumer prices and boost corporate profits. In other words, unless the interventionists with their fiscal and monetary policies engineer an asset price collapse (about the last thing they will do intentionally), the top 0.1% will continue to gain at the expense of just a bout everybody else. Don’t misunderstand me. I am not blaming the 0.1% for snatching an increased share of the income and wealth pie. They were in a better position and more able to take advantage of globalisation and monetary inflation than the vast majority of Americans. Moreover, their wealth allowed them to manipulate governments, their agencies, the lawmakers and regulators, etc. (especially central banks and treasury departments) for implementing policies that would greatly benefit them. Thus, their share of the wealth and income pie exploded (see Figures 2 and 6). 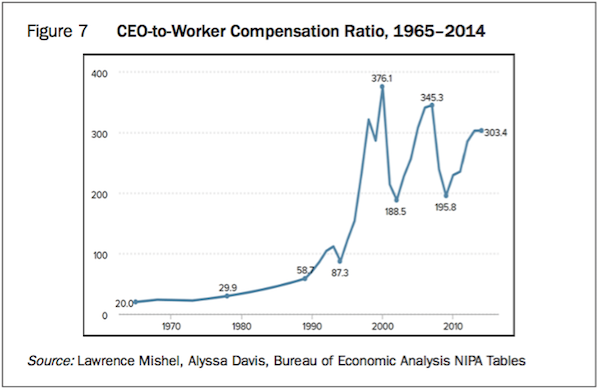 I admit that the statistics compiled by Thomas Piketty and Emmanuel Saez should be taken with a grain of salt, but the expansion of CEOs’ salaries relative to the salaries of workers does support the fact that the 0.1% have done very well compared to workers (see Figure 7). We have a system in place that is based on fiscal and monetary policies, and laws and regulations, that favour the corporate elite, the largest corporations, the captains of finance, and the 0.1% in general, because they are the asset holders. This moneyed class will not give up its privileges voluntarily. The privileged class will do everything in their power to keep these favourable conditions in place, which would include money printing in one or another form if there is a recession or if asset markets decline meaningfully (say, to the February 2016 low of 1,810 for the S&P 500). As I said, I’m not discussing these issues because I have some rancour about these “conditions” from which I actually profiteered greatly. I am discussing them because I believe that an unstable system in which the majority of people lose out to the privileged few is simply not sustainable and will end either with a Bernie Sanders-type socialist gaining power or with the establishment of a dictatorship. Democracies promised a level playing field in society, but that certainly does not seem to be in place nowadays. I suspect that we have never yet had a level playing field, but I feel that we are reaching a tipping point where something is likely to give, and I am afraid that this “something” could be the inflated asset markets.